Some days ago I was looking for a place to have lunch and I ended up eating at a wok restaurant. While I was eating I realized I’m getting sick of branded restaurants, shops, etc. Small restaurants are disappearing, giving place to branded chains that popup all over the place, alas Starbucks. It’s not that I have something against a particular brand, it’s more I’m sick of having my choices reduced to a minimum.
. You have them all over the world. The bad thing about Zara is that they’ve crushed most of their competitors. The good thing, to an extend, is that not two single shops have the same type of clothes. They geo-analyze their shops and pump different types of clothes according to the local neighborhood market. Of course, this is just to a certain extent and not all clothes are different. The solution? 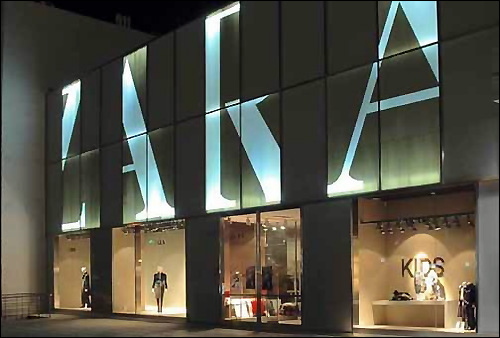 As Zara is doing, keep the brand, create different shops. And I’m not talking about creating different brands under the same company (Inditex has Zara, Massimo Dutti, Oysho, etc. ), but about different shops within the same brand. Of course, this is VERY expensive, but it would at least give us more choices. You wouldn’t talk about Zara anymore, but about the Zara in main street, Zara in Union Square, etc. What do you think? Is the global brand also getting on your nerves? What would you suggest?